Hi my name is Nick and i've played Fat Princess from the beginning, I was in the beta as well however i'm not high rank because I havn't played a lot after the patch was brought out. Hey Nick! It was awesome playing with you last night haha. And it's awesome you're thinking of joining! Although then I won't be the token brit anymore haha. Fan Princess is awesome too, I love the layout. See you in the game! Welcome to the forum Nick, and feel free to let me know if and when you wish to join. Hey Nick!! It's really really AWESOME to have you here! And I hope my freakish love of British accents doesn't freak you out too much. haaa. I am sooo glad I got to play with you last time! But you gotta speak up man! You're British!! What's the use of you, if you don't talk? BB is still the best Brit!!!! I CALL PRESIDENT OF THE FAN CLUB. YES BB YOU ARE THE AWESOMEST. xD Bunny, I feel the same way about accents. I try to make one of our UK members speak up on mic because he's mic shy. Anyway lol. LOL. we're such creepers, tubbay! Lumi - oooh who's the british on your side? i wanna hear him talk hahaa. i got to talk to you for the first time! even thought it was for like 5 seconds haha. Yesshhh I am BB! And yeah it's Massivea/Massive and our newest one is Cymrujam/James (he's the mic shy one 'cept for when he's drunk lol). And I know Bunneh! Lmfao, I should've spoken more. I was called to get on to practice as if it was so urgent, ended up on the wrong team then practice was over. xD Fun either way lol. Wait... Lum is undead? I have her listed as a broc XD. Haha bunny is so happy to have a British boy in the clan. Hey this is NIcks Intros so ONLY HE COULD BE CALLED AWSOME HERE!! 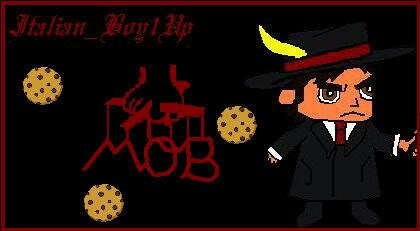 hahah ^_^ Welcome Nick to CookieMOBSter, I'm sure you'll love it here:) and btw your AWWSOOMME! !